Hops (Humulus lupulus) are perennial, twining vines that provide the cones used to flavor beer, and they can also be grown as ornamental plants. Only female plants bear the fragrant, butterfly attracting, flowerlike cones, and they produce them without the help of male plants. Hops are hardy in U.S. Department of Agriculture plant hardiness zones 4 through 8, and grow 15 to 20 feet long and 3 to 6 feet wide. One plant produces several vines, which climb by twining around wires, trellis or similar supports. Hops' flowerlike cones mature in late summer through fall. 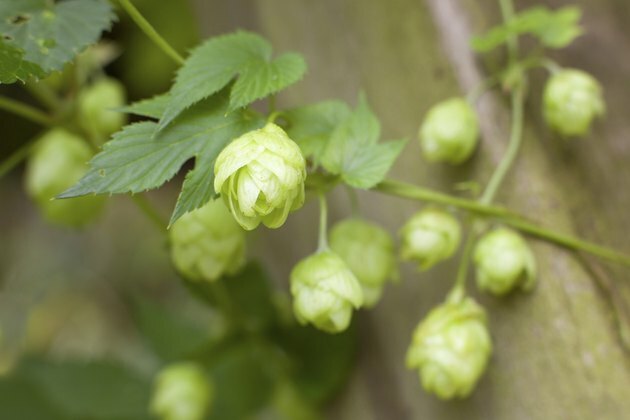 Hops grow in sunny or partially shaded spots in the garden, and prefer moist, freely draining soil. A sandy loam soil with a pH between 6.0 and 7.5, and at least eight hours of sunlight every day provide the best results. Growing hops in an airy, open spot helps prevent a disease called powdery mildew, which can affect the plants. Space hop plants 2 to 3 feet apart, in rows 8 feet apart. Hops don't produce many cones in their first year, but cone production increases as the plants get older. Because of their large leaves, hops need plenty of water. When the weather is dry, established hop plants need 1 1/2 inches of water every week. Water established hops when the soil is dry to a depth of 1 to 2 inches. Hops more than two years old tolerate some drought. Water newly planted hops so that the soil to the depth of the plants' root balls stays moist, but not soggy. Apply water when the soil surface is dry, or every three or four days. Spray water over the root area using a garden hose fitted with a soft spray attachment. Aged manure and high-nitrogen fertilizer supply the hops' nutrient needs. When new growth appears in spring, spread a 3-inch layer of aged manure around the base of the plants. Don't pile manure against the hop stems, because this can cause rotting. When the vines are growing strongly in early summer, evenly sprinkle 1/2 tablespoon of a ready-to-use 21-0-0 fertilizer in a circle about 8 inches from the base of each hop plant. Don't allow the fertilizer to contact the hop stems. Water the fertilizer into the soil. Pruning and training hop vines helps produce the best cone production. Sterilize pruning shears by wiping the blades with a cloth that was soaked in rubbing alcohol, before and after pruning hops. In spring, when hop vines are about 1 foot long, select the three thickest, most vigorous shoots. Prune all the other shoots at the soil surface. Wind the three remaining shoots clockwise around the wires or other support structure, and continue to wind them as they grow longer. Guide the shoots so they can grow apart, allowing light and air to penetrate. The side shoots from these main shoots will produce cones. Ornamental hop varieties provide colorful leaves to brighten garden displays. Common hop "Aureus" (Humulus lupulus "Aureus") has leaves that emerge yellow-green in spring, and turn a deeper green in summer. "Aureus" is hardy in USDA zones 3 through 8, and grows 15 to 25 feet tall and 3 to 6 feet wide. Common hop Summer Shandy (Humulus lupulus "Sumner") is hardy in USDA zones 5 through 9. Growing 5 to 10 feet tall and 1 1/2 to 3 feet wide, Summer Shandy grows yellowish-green spring leaves that mature to golden yellow as the season progresses.